Google chief executive Sundar Pichai defended his company's search practices on Tuesday in the face of questions from lawmakers on allegations of bias against conservatives. 'We approach our work without any political bias,' he noted. Both Republicans and Democrats pushed Pichai on the issue, which has frustrated GOP lawmakers in particular, including President Donald Trump, who has accused Google of bias in the results it gives users who use its search engine. Pichai showed his roots as an engineer - he joined the company in that capacity before moving up the executive ladder - in his answers, which got technical at times as he explained how Google's search engine worked. 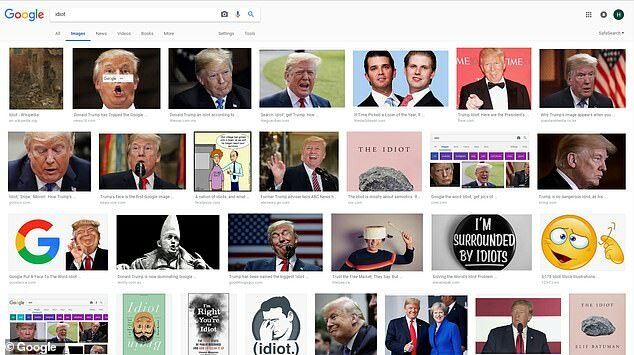 Democratic Congresswoman Zoe Lofgren of California, whose district houses Google employees, asked why - when she googled the word 'idiot' - images of President Trump appeared. 'We provide search today for any time you type in a key word, we as Google, we have crawled and stored copies of billions of web pages in our index. We take the keyword and match it against web pages and rank them based on over 200 signals,' Pichai said at the start of a long, technical answer. 'So it's not some little man sitting behind the curtain figuring out what we're going to show the user,' Lofgren asked. 'We don't manually intervene in any particular search result,' Pichai said. Republican Congressman Lamar Smith pushed Pichai hard on allegations of bias. 'Google could well elect our next president, with dire implications for our democracy,' he said. He asked if it was possible for an individual Google employee to change what shows up in a user's search. 'It's not possible for an individual employee or groups of employee to manipulate our search results. We have a robust framework,' Pichai said. 'I disagree. I think humans can manipulate the process. It is a human process at its base,' Smith said. And Republican Rep. Louie Gohmert used his five minutes of question time to lecture Pichai - never even asking a question. 'You run off conservatives, you embrace liberals,' he added. Republican Rep. Steve King also joined the lecturing. He suggested Google look at employees' social media profiles to determine their political leanings. He also told Pichai that when his granddaughter was using an iPhone, she got a result on him that he wouldn't repeat in public. 'The iPhone is made by a different company,' Pichai responded. Apple makes the iPhone. King then said the phone could have been an Android too, which is a Google product. Pichai responded the incident could have been a notification from another app and reassured the congressman that his team would follow up. Democratic Rep. Ted Lieu also got into the bias debate. He entered his colleagues' names into Google's search engine during the hearing and noted King's top result was an article from ABC News. Pichai emphasized repeatedly that Google found 'limited activity' on behalf of Russians. He said there were only two advertising accounts the company found tied to Russian, which spent a total of $4,700. He told the lawmakers 'you have my promise' that the company is doing all it can to protect the integrity of U.S. elections. The first questions put to Pichai were on Google's data collection and protection of users' privacy. Republican Rep. Bob Goodlatte, the chairman of the committee, asked the tech CEO whether the average user understands the volume of data Google collects on them. 'We go to great lengths' to protect users's data, Pichai reassured lawmakers. 'We remind users to do a privacy checkup. We make it very obvious,' he added. Republican Rep. Ted Poe held up his iPhone and asked Pichai if Google could track him if he moved across the hearing room to sit with the Democrats. Pichai was asked about sexual harassment allegations made against the company. Last month, more than 20,000 Google employees around the world walked out in protest of the company's handling of sexual harassment and discrimination claims. Earlier this year, Google ended its use of forced arbitration in sexual harassment cases. Rep. Pramila Jayapal asked if Pichai will commit to ending forced arbitration beyond sexual harassment. 'We are definitely reviewing what more we can do in this area,' he said. The company's plans for China, where its search engine is currently banned, was another topic that came up repeatedly amid reports Google would launch a Chinese search engine that would comply with the country's strict censorship regulations. Critics are worried that the Google project, code-named Dragonfly, will enable the Chinese government to block its citizens from accessing information it doesn't like and surveil its political opponents. At one point 'we had over a hundred people working on it,' he said. Pichai revealed Google has no current plans to expand to China. 'Right now, we have no plans to launch in China. We don't have a search product there,' he said. But he did argue that access to information is a human right and pledged the company would be 'fully transparent' if they do proceed with plans to open a search engine there. He was vague when asked about future plans. Other lawmakers had more personal questions - and suggestions - for Pichai. He also revealed he googles himself and isn't happy with the search results. He appeared to be mocking conservative critics who claim bias in search results. Cohen complained he had the opposite problem. 'This weekend I was on MSNBC four times and the first thing that comes up is the Daily Caller,' he told Pichai, adding that Breitbart News also came up several times. 'It's hard for me to fathom being on 8 minutes ... and there's more content on Breitbart News,' he added. Pichai promised to follow up. 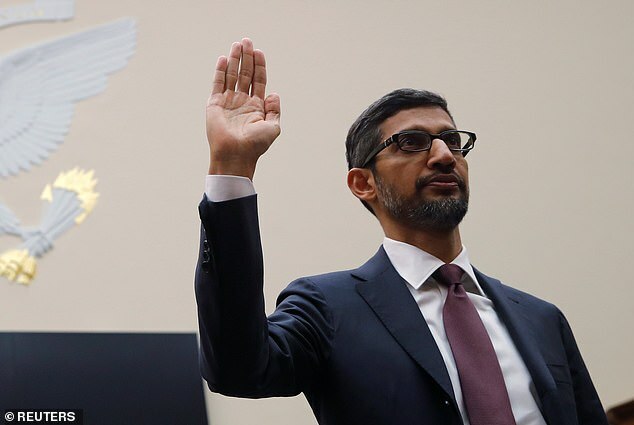 Tuesday's appearance was Pichai's first time testifying before Congress. He was sworn in - as all witnesses are - and was careful in his response. He made many promises to lawmakers to follow up, which is a way for a witness to give a more detailed, nuanced, carefully worded answer at a later time. Pichai sat quietly before the panel of lawmakers as members made their opening statements. His highly anticipated appearance is being closed watched by those in the tech industry and those who use the internet to push their platforms, including GOP operative Roger Stone and InfoWars founder Alex Jones - both of whom sat in the audience for Pichai's testimony. McCarthy warned of a 'widening mistrust' between tech companies and American people. He said that could be alleviated by transparency and answers. He warned the panel wants to know that any political bias among Google employees does not show up in its products. McCarthy, who has been a fierce critic of the technology company, said a question before them was whether American technology companies are surveying as instruments of freedom or fo control. Democrat Rep. Jerry Nadler, the ranking member on the committee, warned against focusing on 'right wing conspiracy theories' during Monday's questioning. He said it was a 'fantasy' that there was political bias in its search results, a charge President Donald Trump has made against the internet giant. 'No credible evidence supports this right wing conspiracy theory,' Nadler said. He urged the committee to focus on whether outside activists were using Google to spread false information to undermine American democracy. Pichai, in his opening testimony, said the internet giant steers clear of 'political bias,' arguing that this is a core principle of its business to maintain trust of users. Pichai strongly denied claims made by by PresidentTrump and his backers earlier this year that Google operates with a political agenda that suppresses conservative voices. Pichai said Google strives to offer 'platforms for diverse perspectives and opinions' without promoting its own agenda. 'I lead this company without political bias and work to ensure that our products continue to operate that way. To do otherwise would go against our core principles and our business interests,' he said. Pichai said that Google - which on Monday speeded up the shutdown of its Google+ social network after a second data security bug was discovered - supports federal privacy legislation, without offering specifics. 'Protecting the privacy and security of our users has long been an essential part of our mission,' he said. 'Even as we expand into new markets we never forget our American roots,' he said. The appearance tested Pichai's ability to be the public face of the search engine giant. But he has slowly made in-road into the political world. Pichai was the White House on Thursday for a meeting between White House officials and tech execs, including representatives from Microsoft, Oracle, IBM and Qualcomm. President Donald Trump stopped by but it was Ivanka Trump who took the lead. The use of artificial intelligence was the main item on the agenda. Pichai is dipping his toe in the political well in the wake of waves caused by his predecessor Eric Schmidt, who had powerful political allies in both parties and counted former President Barack Obama as a friend. Google had some of its political peaks in the Obama years when it beat an antitrust probe and secured favorable policies on net neutrality, online liability and copyright issues. But the political winds have shifted since then for online companies. Lawmakers are examining the need for stronger federal protections governing the collection of online data and some Republicans complain there is a suppression of conservative speech. President Trump has tweeted his complaints about the company, charging Google's search results are rigged. Pichai has kept a low profile since becoming Google's chief in 2015. A native of Chennai, India, he worked his way up the ranks at the company, starting as an engineer. He has already made overtures to Washington after the company angered lawmakers on both sides of the aisle in September, when it failed to send top leaders to appear at a Senate Intelligence Committee hearing along Facebook's Sheryl Sandberg and Twitter's Jack Dorsey. Lawmakers left an empty chair at the witness table to symbolize Google's absence. Pichai flew to Washington D.C. later in September for individual meetings with lawmakers - and agreed to Tuesday's committee hearing.